Super Bowl Commercials: Entertainment or Marketing? The Super Bowl will be played this Sunday and along with the game come the year’s most expensive and, many times, creative TV commercials. The Super Bowl has been the launching pad for some of the most memorable ads ever aired. However, at $3.5 million to place a 30 second spot, are they worth it from a business perspective? Are they effective in marketing the products they pitch or are they purely entertainment? The answer lies in the marketing goals that the ads are meant to achieve. We often measure the return on investment (ROI) of ad campaigns in a couple of different ways. The most important ROI of any marketing campaign is an increase in sales. This is the ultimate marketing goal of any ad. This has been the criticism of Super Bowl commercials for years. Are they entertaining? Yes. Do they drive sales? Many times, not immediately. Before there can be a sale, there must be an awareness of the brand. After watching the Super Bowl, are you more aware of a particular brand? 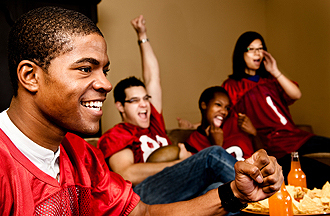 If the goal is awareness, the Super Bowl has historically been a great venue for advertisers. For instance, the domain registry company, Go Daddy.com, was relatively unheard of just a few years ago. They aired a controversial Super Bowl ad (they claimed the real ad was banned by Fox Network and could be viewed on their web site) and they became a household name. It was juvenile and sexist… but it worked in making the Go Daddy.com brand the king of online registration. Even though most of the companies that advertise during the Super Bowl are already established brands (i.e. Pepsi, Anheuser-Busch, Snickers, Volkswagen, etc. ), they have used this venue to launch new products. This has been true of the movie industry as well, who will promote its spring and summer releases at the Super Bowl. It is estimated there are 110 million viewers of these commercials when they air (not counting the online viewers of the commercials). And unlike the rest of the year, there is a buzz around the Super Bowl commercials. People really watch them. They have been given special celebrity status, almost like a reality TV show (with their own online voting for winners and losers). My assumption is that you don’t have $3.5 million in the budget to buy ad time on the Super Bowl broadcast. However, you should take note of the techniques that advertisers use to make the audience remember their brands. First, there is typically a gimmick to grasp your attention. It may be something outlandish (like a group of dogs barking a familiar tune) or something that takes you by surprise. In any case, it is hard to look away when you are watching a good commercial and the gimmick is working. Notice how the brand name is placed closely behind the highest point of the gimmick – when the ad has caught your attention and has gotten an emotional response out of you - laughter, empathy, ecstasy, anger (think of political ads here). Secondly, note that there is not a lot of complication in understanding what the name of the brand is or what the product does. Snickers is a candy bar. Pepsi is a soft drink. The Honda CRV is an automobile. Whether the ad is using cute animals to get your attention or a celebrity reliving his character from an old movie, when it comes time to promote the brand, nothing else clutters the screen. The product takes center stage. It is named with a short tag line and that is it. In that moment, nothing else is competing for your attention. One of the biggest mistakes that you can make is to complicate your brand in your ads (and it does not matter whether it is TV, print, email marketing, or trade show displays). The point of brand awareness marketing is that the consumer will recognize your product after they see your ad, not that they know all about the product. Think back a couple of seasons ago to the Betty White Snickers Super Bowl ad. Betty was playing a pick up football game when she gets smashed to the ground. Friends tell her that she is playing like Betty White… and when she eats a Snickers bar, she turns into the guy who wasn’t himself until he swallowed a mouthful of chocolate, caramel and peanuts. Although, they don’t tell you all about the ingredients of a Snickers bar, do they? No, they just cut to the brand name and the tag line – "You’re not you when you’re hungry, Snickers satisfies.” What if I don’t like caramel? What if I’m allergic to peanuts? I would not really be in the target market for a Snickers bar, would I? It does not matter in brand awareness. The marketing net is cast very wide. The next time someone is in a checkout line and spies a Snickers bar, I want them to remember instantly what it is… and if they elbow the person next to them in line, repeat the tag line and share a laugh, all the better. Sales follow awareness. This is hard concept for those in charge of sales to wait upon after spending marketing dollars to promote their products. The market does not typically buy a product unless they are aware of the brand. I mentioned the Go Daddy.com ad that aired back in 2005. Since then, Go Daddy.com has become the leader in domain registrations. They also have made a name for themselves with their series of banned ads that have become viral hits. After their Super Bowl ad was aired last year, they had the largest amount of online traffic in a single day. And last year, they increased their sales 466% over the previous year. To get a sneak peek of this year’s Super Bowl commercials, click here. Top 10 Super Bowl Commercials We Can't Wait For (and Some We Don't Have To!) by Natalie Finn, E online, February 1, 2012. So which ones were your favorites this year? I liked the Fat Dog who goes on a diet and chases the VW. I liked the little boy in the pool for Tax Act. But I also liked the Jerry Seinfeld and Jay Leno commercial for the new Acura.